BOB ABERNETHY, anchor: We have a story today about other people wrestling with the notion of brotherly dwelling. They’re Americans and Mexicans whose community is about to be bisected by the fence the government is building along the Rio Grande, and that fence has dramatized major questions about immigration policy. Lucky Severson reports from Eagle Pass, Texas, and Piedras Negras, Mexico, across the river. Lucky Severson reports from Eagle Pass, Texas, and Piedra Negras, Mexico, across the river. LUCKY SEVERSON: He seems to know everyone here in Piedras Negras, Mexico even though Chad Foster is actually the mayor of the town across the border — Eagle Pass, Texas. He crosses the bridge connecting the two towns and two countries, sometimes several times a day. Mayor CHAD FOSTER (Eagle Pass): Eagle Pass and Piedras Negras have grown up together, you know. I’ve got as many friends in Piedras if not more than I have in Eagle Pass, and we really are two countries, but we’ve historically been one community. SEVERSON: It’s the future that worries the mayor, especially if the Department of Homeland Security, DHS, is allowed to build a wall that would, in the mayor’s view, divide the two towns. DHS has filed dozens of suits against Texas individuals and communities, including Eagle Pass, to force them to give up land for the wall. (to Mayor Foster): And this is where the wall would go? Mayor FOSTER: Absolutely, this is the alignment. SEVERSON: And what would the golf course become? Mayor FOSTER: In essence, we’re ceding our golf course to Mexico. We’re fencing it out. SEVERSON: The wall would cut through the Eagle Pass golf course and a city park, which may be the greenest piece of land in the whole county. It would also eliminate a planned development along the Rio Grande River. It’s not only the idea of the government confiscating their land that troubles the people of Eagle Pass. It’s the wall itself. They’re afraid of what it will do and won’t do, and what it symbolizes. 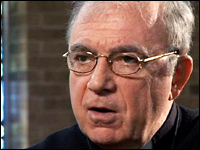 Father JAMES LOIACONO (Pastor, Our Lady of Refuge Catholic Church): Think of the Berlin Wall. What did that say about the government of East Germany? SEVERSON: Father James Loiacono, pastor of Our Lady of Refuge, says every symbol speaks about the people who propose it. Fr. LOIACONO: What are we saying about ourselves when we propose a wall? How can we put a wall between Eagle Pass and Piedras Negras when we’re the same family? Mayor FOSTER: It’s separating families. I guess that’s the best description. I mean, it’s as if I were to put a wall up between my house and my brother’s house. SEVERSON: The mayor says 95 percent of the people of Eagle Pass oppose the wall, but there are some who favor it, like Charles “Dob” Cunningham. CHARLES CUNNINGHAM (Resident, Eagle Pass): There’s someone, looks like on horseback, coming across. See, he’s up to no good. Oh, I’ve been robbed many, many times, as anybody on the border has been robbed. 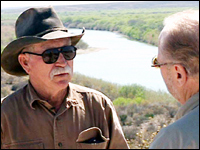 SEVERSON: Cunningham owns more than a mile of land along the Rio Grande. He retired after more than 40 years with the border patrol, most recently as director of the Eagle Pass Port of Entry. He says there has been a lull in the number of illegal crossings, thanks in part to air and ground patrols and the ever-present surveillance cameras. Mr. CUNNINGHAM: You see, this tower has two cameras, and the camera that should be looking at him is broke. SEVERSON: Cunningham says when the cameras that overlap the border work, they help catch “illegals.” But the $65,000 cameras with night vision don’t always work. It’s one reason he favors a wall, or fence, along some parts of the Texas border, but says Congress and Homeland Security are mistaken if they think the wall will solve immigration problems. Mr. CUNNINGHAM: Yeah, they’re stuck way up there in Washington, and a lot of them don’t have a grasp of the actuality of what’s happening. Mayor FOSTER: It’s not securing the border. It’s conveying a false sense of security to the interior citizens of the United States. In border patrol’s estimation, it’ll take two to four minutes to breach the border fence or border wall. SEVERSON: Father James has offered a sanctuary to many undocumented aliens going or coming across the border. He says it’s his sacred duty as a Christian. Fr. LOIACONO: Exodus 20:19, it says “You shall not molest or bother the resident alien in your land, for you once were aliens in a strange land.” And all through the Old Testament and the New Testament this is an imperative — not just a suggestion. It’s an imperative. SEVERSON: Albert Ellis got so upset with Father James for aiding illegal immigrants he walked out of church. ALBERT ELLIS: And one day I went into his office and I told him, I said, you know, you shouldn’t be helping these people. I said if I help them I go to jail, you know. SEVERSON: Ellis is a former border patrol agent who favors a wall but says it won’t stop illegal entry. Mr. ELLIS: I think we could have spent some of that money for the walls on detentions camps, you know. Just be able to put them in jail awhile, maybe they’ll slow down some, you know. SEVERSON: This is the House of Pilgrimage in Piedras Negras. It’s affiliated with the Catholic Church and has offered sanctuary to about 35,000 illegal immigrants since it was founded in the early 1990s, according to the director, Magdalena Galan. MAGDALENA GALAN (Director, House of Pilgrimage, Piedras Negras): I’ve seen them cry. I’ve seen people that they have to leave their families, and they cry over that because they leave them with somebody else to take care of their children while they come to try to feed them over here in the United States — get money to feed them. SEVERSON: And most of these men here, are they from Mexico? El Salvador, Guatemala, Honduras, Nicaragua. Most of the men in this room came from south of Mexico. Some looked for jobs here before discovering that jobs and wages in Mexico were no better than in their own countries. Some have walked 20 days to get to Piedras Negras. They plan to sneak across the border into the U.S. in the coming days. (to men at the House of Pilgrimage): I don’t want to leave home. I wouldn’t want to leave my family and go to another country. They’re willing to risk a lot to do that. Why? Most men here had the same answer: When they can get a job in their country, they can earn about 50 cents an hour — not enough to feed a family. Mr. CUNNINGHAM: It’s a terrible situation. We have personally given money to illegals who have come by our house. We’ve fed them. We’ve clothed them. We have a great empathy for them. We feel sorry for them. If I was in their shoes, I’d be here the next morning. SEVERSON: Cunningham says the first thing that needs to happen is for Mexico to fix its economy so people won’t feel the need to leave the country. Father James says he understands why many Americans are angry and frustrated and that there will never be a completely fair and just solution. He says his views are guided by scripture and tradition — that it is not only the moral duty of a father to care for his family, it’s a human right, and one Americans should recognize. Fr. LOIACONO: A man who is starving to death and whose family is starving to death and can’t find work takes bread out of the supermarket. He didn’t steal. It’s necessary for life, and so out of charity and justice we have to recognize that he is not a thief. Mr. CUNNINGHAM: I’m well aware of these religious people, and I think I’m a religious person. But the churches aren’t paying taxes, and they’re not being affected by the vast movements of people and the drugs and the sociopaths and these criminals that come across. Mayor FOSTER: I live within a quarter of a mile of the river. We’re not afraid. There’s never in the history of the world been a known terrorist to come out of Mexico. The only terrorist that we know of came out of Canada, and they came across ports of entry. They did not come between the ports. (driving in truck, watching border agent): He’s looking to see if he can find any footprints coming across this. SEVERSON: The number of agents working along the border has increased dramatically. In Mayor Foster’s view, all the agents and cameras and border patrols won’t fix the problem without fixing U.S. immigration policy first. Mayor FOSTER: Well, if you have a kitchen sink that has a busted pipe, rather than fix the pipe we’re sending in more mops. Well, let’s fix the pipe, which is immigration reform. SEVERSON: Albert Ellis thinks that the best fix is to enforce the laws that are already on the books. Mr. ELLIS: This is a country of laws, you know, and if we don’t enforce them we’re going to end up like Mexico. SEVERSON: In Father James’s church there is a statue of Christ that was found floating in the Rio Grande River. For Father James and his parishioners, it has become a sacred artifact. Father LOIACONO: I gave it the name The Undocumented Christ because we don’t know where this Christ figure came from, and so it’s undocumented. But it also came wet, because it came in the river. It came homeless to us, and to me it’s Christ identifying as undocumented. SEVERSON: Father James thinks The Undocumented Christ is more than just a symbol. Father LOIACONO: And I think in a real sense perhaps we could see this as God’s message to our nation. How shall we treat those who come to our border, and what does the wall really mean? What is it saying? Jesus, stay out? SEVERSON: Congress, Homeland Security, and many Americans have a different view. They think the wall sends a powerful message, one they approve of: Illegal immigrants stay out. For Religion & Ethics NewsWeekly, I’m Lucky Severson in Eagle Pass, Texas.